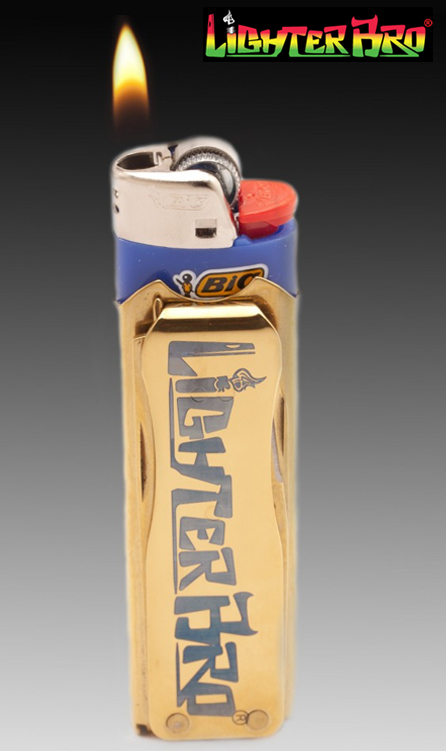 Fits snugly around a standard Bic lighter. The shape is unique and resembles a japanese katana blade. It is double-V ground and is thoroughly heat treated 420 series stainless steel. It comes out of the box extremely sharp. After 2 weeks (with no sharpening) of cutting everything from nylon, wood, spectra rope, to cardboard, it still very sharp. The flat tip also functions as a flat-head screwdriver. Always hand to have! Fits my glasses perfectly. I took apart half of my sony camera and my old Mac Book Pro with it. This long thin tools works as a poker as well. It cleaned out my iPhone ports and cleaned out the pipe. Usually you don’t see scissors that cut well on tools under $15, but these cut amazingly well. They has a good feel and cut thin stretchy plastic, fabric, nylon cord, cardboard, and even thick paperboard. The cut was clean and through for the entire length of the blade. The return spring is smooth and is riveted into the base so it cannot fall out. The bottom of the tool has an opening that will grab a bottle cap and pop it off with ease. It is rare you find the opener feature permanently deployed and yet doesn’t not stick out and add to the the dimension of the tool. This is an all Stainless steel, hardened, and polished to a very attractive and durable finish. The logo is laser engraved and does not fade with use. LighterBro has a gold version which is the same material, only it has the same Titanium Nitride coating used on Milling machine cutters and high-end drill bits. The case is also designed to hold and dispense organic hemp wick. One of the samples I sent you has the hemp wick already loaded. The quality was on par with the well known tools costing twice as much. 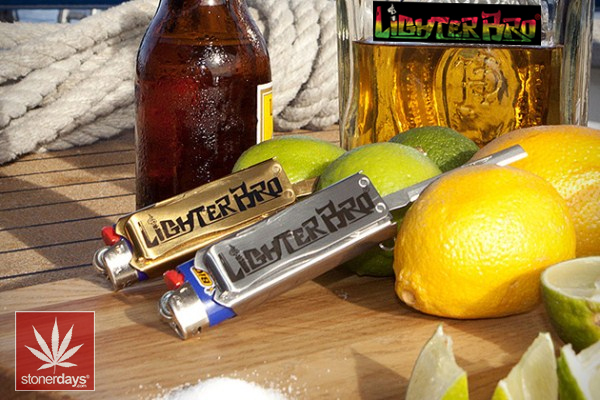 MSRP is $9.99 for LighterBro silver and $12.99 for gold. 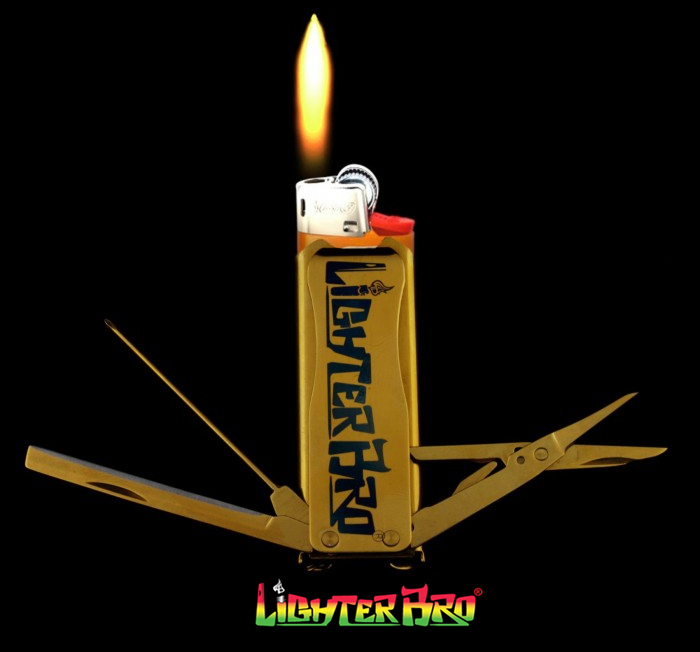 The Lighter Bro is great I really enjoy it’s sleek design. 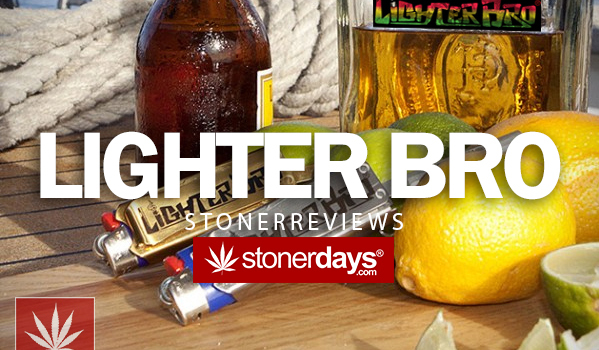 Turning your average lighter into a useful tool.